Thomas asked: "In controlling voles and moles, you covered how to trap/bait moles, but offered very little information about voles. I would appreciate a little more information on eradicating these little pests." Answer: Thanks for writing and pointing that out to me. As a side note, I am assuming that Voles get their name because they use the same tunnels as moles, but are not moles. Rather they are a mouse type rodent with different habits. Therefore, it is important to know which one you have. I am glad for the input and will write more about catching and controlling voles. Sometimes voles will be caught in mole traps, but rarely. I have found a different and better way to catch voles and will explain it here to you. We mostly have mole problems over here, but getting rid of voles is actually easier than killing moles. First, if you have had lawn moles before, keep in mind that voles will often use the same tunnels made by moles. However, unlike moles, voles will come out of the mole tunnels to feed above ground. Vole surface holes will not generally have dirt piled around them, but will be an open hole less than two inches wide. You will see clear paths from the hole outward where the vole travels along the surface to eat and follow the same path back to the hole. During the warmer months they will feed on the surface more at night, but in the winter will often be out in the daylight. Directly around the hole the grass will often be eaten down quite a bit, which is another indication of voles. They eat roots they can access in the tunnel, but also plants and other vegetation above ground. Owls can help keep their numbers down in the summer. If you live in the country, many animals will eat voles when found outside the tunnels. In the suburbs or small towns where woods or forests are nearby, raccoons, foxes and owls are predators. If you live in a city or heavily populated community your main option to rid yourself of these pests may be by trapping. Controlling voles is not hard. Take a regular mouse trap or purchase vole traps. A vole trap looks like a mouse trap, except it has a wider trip plate on it. When placed properly, the vole will run over the trap and trip the spring. Therefore, it is important it is placed as described below. This is important: Before placing the trap, you must first drill a hole near the center of the mouse/vole trap and put a three to four inch nail through the hole. This will hold the trap securely flat on the ground. 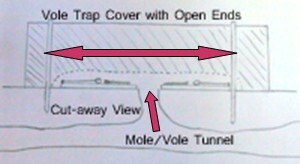 The Vole Trap Drawing on the right shows where to place the nail. Now find the vole's exit hole and place one trap on either side of the hole. The traps should be very close to the hole, about an inch away. 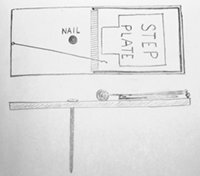 Make sure the nails are pressed all the way into the ground to secure the trap in position. This part is also very important: Next, after the traps are in place in a straight line on both sides of a hole, you will then need to place a cover over the traps and hole. An 18 inch section of old rain gutter is a popular cover. You can make a similar cover from sheet metal or wood. It must not be much wider than the traps, so the vole is forced to exit the hole and run across one of the traps to feed. Place a brick on top or use "U" shaped spikes to hold the tunnel in place. The Drawing on the Left shows a cut away view of the traps on both sides of the hole with a cover on top. You will not need to bait the traps since the vole will be forced to travel over the trap to get out of the "tunnel" you placed over the hole. This is one of the most effective methods of controlling voles. Question 2: "Advice on Vole Traps"
Jennifer asks: I think I have some voles eating my plants at night and would like to try and trap them. I have no experience in controlling voles. What do vole traps look like and where can I get some? Are they expensive? Are they hard to trap? Thank you for your question. Controlling voles with vole trap can be learned with very little effort. Vole traps look similar to mouse traps, except commercial vole traps have a larger trip plate. The ones I have used are made by "Victor", who also makes mouse traps. Mouse traps have a small trip plate because you apply a bait to attract the mouse. However, vole traps do not need to be baited. (Although they can be baited) Instead the trap is sprung when the vole steps on the plate. If you have a mouse trap, you can glue a small section of a large Popsicle stick to the plate to increase the size of the plate. This will prevent the vole from stepping around the plate and continuing on his way. When controlling voles is essential, but keeping the vole alive is also essential for you, you have an option for that. You will need to use a "live catch trap". A popular product is the "Sherman Trap". They will need to be baited with an apple or peanut butter to attract the vole. It needs to be set at or very close to the exit hole a vole is using. Live catch traps will need to be set in the late evening and checked right after sunrise. If the trap is sprung, be careful checking the trap. The traps I have seen do not have mesh sides so you cannot see what is in the trap. It may contain a vole or it may contain a similar sized animal, such as a mouse, rat, etc. Use leather gloves to open the trap to release its contents, but not in your neighbor's yard. Keep in mind that voles or moles do not hibernate and feed all year. When you think you have become a pro at controlling voles, you may find they will repopulate later. Don't get rid of your traps, but save them for future use. Sherman Traps can be purchased online at shermantraps.com or you can search the web for a different company. There are several gimmicky products available labeled for voles, moles, etc. Sonic spikes are an example. They emit a loud sound that is supposed to chase away rodents. Most people will tell you they don't work. Some people claim success after a week or two of using them. But my page on Mole Behavior and Trapping will tell show that moles will only stay in a area as long as the food supply is available. In a week or two they will move on anyway. Other moles may later take over the runs or voles often use them as a way of getting around. You really need a trap for getting rid of voles and moles. Using a preemergent herbicide is the most effective effective way of stopping crabgrass and foxtails from growing. Here are a few questions from our visitors about using preemergents. Chinch bugs can be very damaging to lawns, especially St. Augustine and Buffalograss. Learn ways to identify them and how to control these pests quickly. Bald faced hornets, distinguished by their large round or oval nests, have a fierce reputation. They will defend their nest with multiple stings. Learn how to safely remove a nest using clever tricks of the trade.